Korean culture and lifestyle is being embraced by Filipinos these days as they wear Korean fashion, watch Koreanovelas, of course eat Korean food. I myself was hit by the Korean craze when I started to become addicted in some heartwarming, tear-dropping Korean series and films. My family is also into Korean groceries where we would buy some delicacies, chips and even Korean ingredients for a Korean food fest at home. We would normally drive to places in search for a good Korean restaurant and find the perfect bulgogi and barbecue in the Metro. Imagine my excitement when I heard that a new Korean Barbecue house is one of the few restaurants that sprouted in BGC earlier this year. Sariwon Korean Barbecue may be a fairly new restaurant but it was easily embraced by Filipinos in our country. 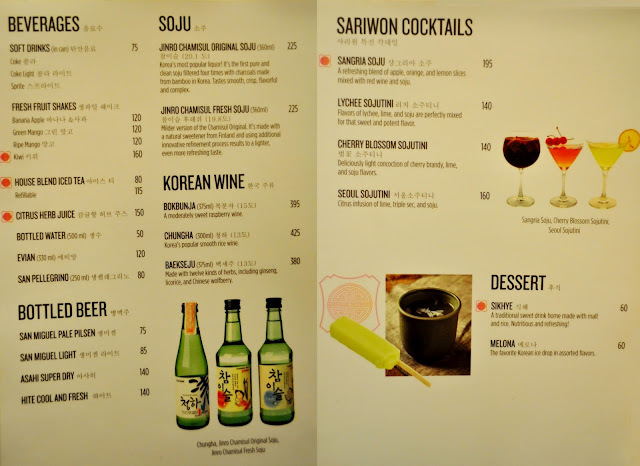 A normal weekday night at Sariwon is still packed with diners and loyal patrons. Imagine what a weekend night would be like. 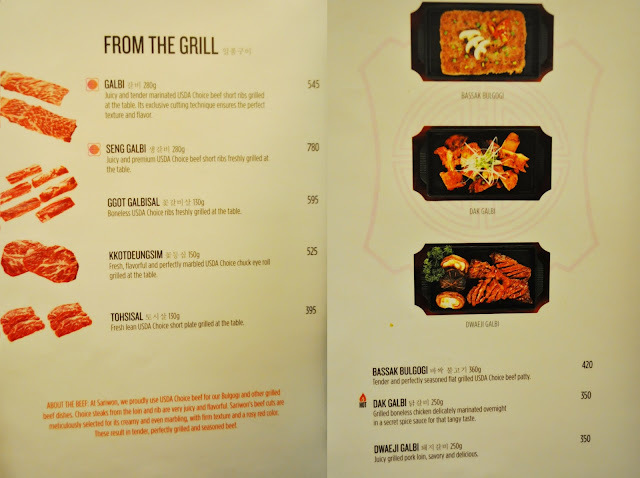 They are currently on soft opening but diners continue to flock this place for an authentic Korean BBQ feast. Our Sariwon Korean Barbecue experience started with some tabs that expanded into tissue wipes when hot water was poured on it. Followed by a variety of complimentary Korean side dishes called banchan for us to try while waiting for the main courses. The first appetizer was a plate of fresh lettuce with shredded cabbage and sliced cherry tomatoes in sesame vinaigrette dressing. Series of banchan classics followed such as kimchi, bean sprouts and anchovies. What interests me most was the sweet mashed potato and pumpkin which is not normally served in other Korean restaurants that I know of. I also love the crispy roasted anchovies that was a bit sweet and spicy. To start our Korean barbecue adventure, we were served with Sariwon's best-seller for grill choices- Galbi. Galbi literally means "rib" that is generally made of marinated beef short ribs. Sariwon offers Galbi and Seng Galbi with the former being less expensive as it has been pre-marinated and the latter being freshly marinated. Being pre-marinated in their Korean base sauce, the marinade infused the meat with juicy flavors but at the same time retained its freshness and tender texture. Sariwon's Beef Galbi is made up of USDA Choice beef that were meticulously selected and exclusively cut to ensure even marbling. This cutting technique ensures that the meat brings out the perfect texture and flavors. Our server was kind enough to assist us in grilling our beef and then cut the meat into pieces. We then started to wrap these premium meat pieces in fresh lettuce and sesame leaves that came with every order. Add a brush of some Korean soybean paste to enhance the flavor just the way Koreans do it. I would recommend you not to miss the Galbi in Sariwon. The tender beef ribs were soft to chew and the taste was sweet and flavorful. I love their Beef Galbi! From its texture to its taste, there's nothing you would not like about it. Next was the classic Korean pancake or also known as Pajeon. For Sariwon's version, they offer Seafood Korean pancake called Haemul Pajeon. It consists of assorted seafood toppings such as squid, shrimp and oysters with fragrant green onion slices. What's great about their pajeon is that it has lots of toppings that gave the pancake full of flavors and crunch to every bite. A small dab to the dipping sauce and you'll have a taste of Korea's great tasting pajeon. For our chicken dish, we had the Dak Galbi which is grilled boneless chicken marinated in a secret sauce for a tangy and spiced taste. It was served in a sizzling hot iron plate to keep the chicken galbi warm. The chicken pieces were tender with just a tad of spiciness from the secret sauce. Another Korean favorite is the Japchae or Korean glass noodles made from sweet potato. The stir-fried vermicelli noodles were mixed with generous servings of vegetables sprinkled with sesame seeds. I love the touch of black fungus that gave a nice crunch to the noodles. Sariwon's Japchae was not too oily yet it remained glossy and chewy with smooth texture and sweet taste. I just wish their serving could be a bit bigger 'cause I myself could finish a whole bowl. Of course, a visit to a Korean restaurant wouldn't be complete without the classic Bibimbap. A signature Korean rice dish that is topped with assorted vegetables and raw egg. 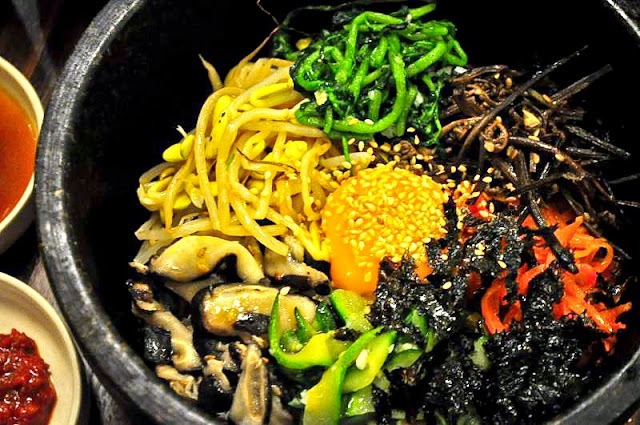 Sariwon's Dolsot Bibimbap is served in a hot stone bowl that gives a nice crisp and toasted bottom layer of the rice. (Soccarat). The bibimbap was a bowl of colors that entice diners to enjoy this classic healthy dish even more. After mixing everything together, thin layer of egg yolk coated the sticky rice to keep it moist and flavorful. 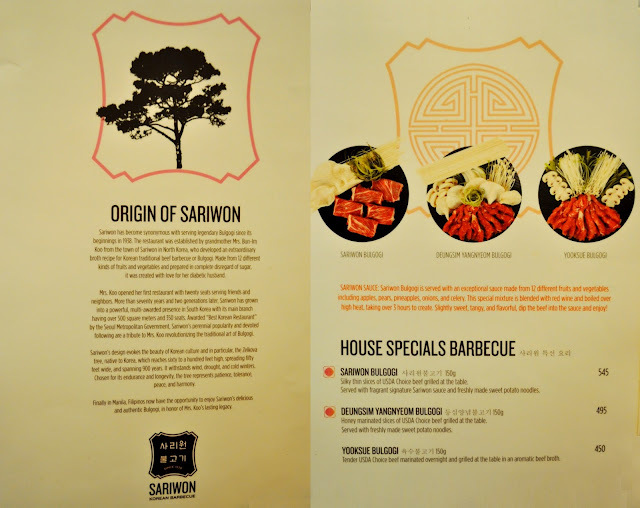 Last but not the least, Sariwon's House Specials Barbecue- Sariwon Bulgogi. It is basically thin slices of USDA choice beef with mushrooms and leeks grilled at the table. It is cooked with the hot fragrant signature Sariwon Sauce which is made from 12 different fruits and vegetables that includes apples, pears, pineapples, onions and celery and then blended with red wine. What's more interesting about this dish is the freshly made sweet potato noodles that comes with sweet and tangy special sauce. It has this soft and chewy texture that was firm and delicate at the same time. More like a "melts in your mouth" texture but it was not mushy like overcooked noodles. In fact, even if it was soaked in the special sauce for quite some time, the noodles retained its chewiness and soft al dente texture to the last bite. For refreshments, some of Sariwon's best-sellers are Citrus Herb Juice (P150) that has this light and refreshing citrus and cucumber flavor, and Kiwi Fruit Shake (P160) that was freshly made and served in a tall elongated glass. Sariwon also serves their own concoction of cocktails such as Sojutinis and their best-seller Sangria Soju (P195). We got to try their Cherry Blossom Sojutini (P140) that is made of cherry brandy, lime and soju flavors. I found this drink too strong for me since I'm no Soju drinker but the luscious taste of cherry gave a nice hint of sweetness to it. The Sangria Soju on the other hand was fruity and sweet with a sudden kick of alcohol from the soju. 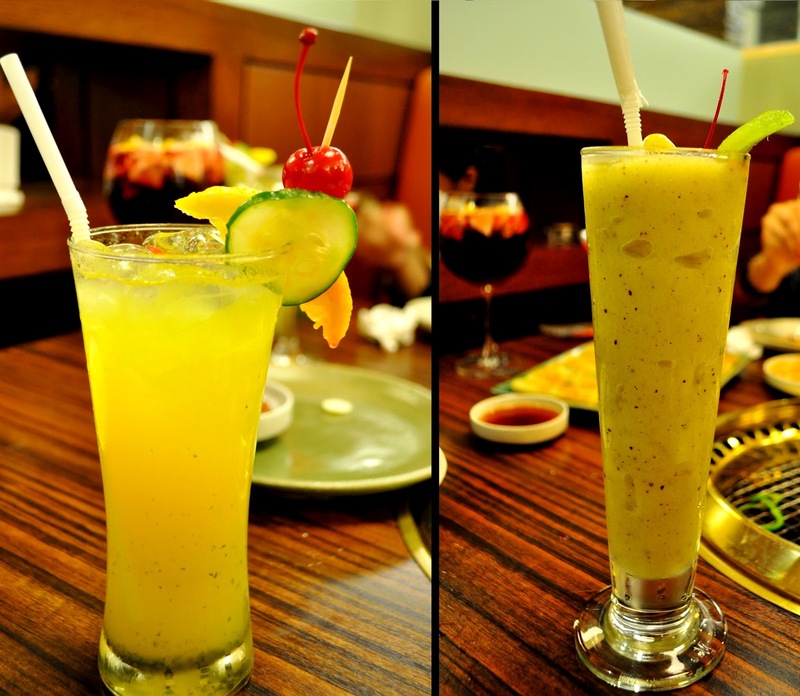 It is a refreshing blend of apples, oranges and lemon slices mixed with red wine and soju. It was somewhat the same as the sangria we tried at Cova but this was stronger and less sweet. To cap off our Sariwon Barbecue adventure, we tried the traditional Korean sweet drink called Sikhye. It is a famous rice beverage dessert that is made of rice and malt. It was also garnished with some pine nuts and plum to give a fruity and earthy crunch to the sweet and nutritious cold drink. With numerous Korean restaurants emerging from every block of the city, Sariwon Barbecue Restaurant brought authentic Korean BBQ experience for the Filipinos in the heart of BGC. It opened its doors to the public by serving authentic and fresh selections that will surely satisfy your Korean appetite. great post, very detailed.. i want my bowl of bibimbap now! I haven't yet tried eating korean foods, mostly I eat easy chinese recipe which I made at home. I hope I can eat korean foods sooner. I haven't tried any Korean dish before but with your posted food pic above, I might try some soon. Hope to visit the place as well. Like so much Korean food.There is one Korean restaurant here in Riyadh and we always frequent that,as other Filipinos do. Sariwon is a must try when in the Philippines. I have yet to indulge in a proper korean cuisine. I honestly only tried korean barbecue and I'm not sure if thats even authentic haha. I'll definitely visit Sariwon soon! I love Korean Barbeque and enjoy the barbeque your own experience. I made my own Korean Bolgogi but I sure order it in the restaurant, love it with lots of rice. I make my own orean barbeque or bolgogi but i always it in a restaurant too to compare hte taste and see if I can make their version. 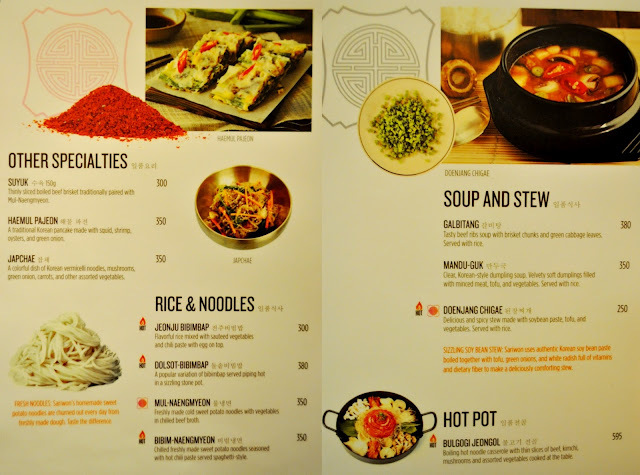 To be honest, I've never tried any Korean restaurants yet, so do you think this is the best ever so I could try one this time? BTW, I love the detailed review you made fro Sariwon. I love Korean food. I wish I could remember the Korean Resto in Las Vegas that I've been to, that's the best one I've tried so far!